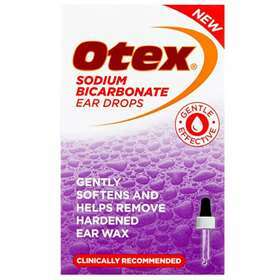 Otex Sodium Bicarbonate Ear Drops 10ml, gently softens and helps remove hardened ear wax. Tilt head, and gently squeeze 3 to 4 drops into the ear without touching the ear with the dropper. repeat twice daily for up to 5 days. Always replace cap tightly after use after use and return bottle to carton. Discard 4 weeks after first opening. Do not use after the use by date shown on end flap of carton and on bottle. You have a history of ear problems, unless under the close supervision of your doctor, nurse or pharmacist. You are putting anything else in the ear. Your ear drum is (or has been) damaged. There is any other problem with your ear (such as pain , swelling or discharge). You have had your ear syringed in last 2 to 3 days or used other objects to remove wax. Sodium bicarbonate, glycerol, dichlorobenzyl alcohol and purified water.